Scheduling an appointment with an OB/GYN can be an intimidating experience for many women, and for many, this fear keeps them from going to see a doctor altogether. However scary the gynecologist can be, it is never a good idea to steer clear. In many cases, a preventative OB GYN visit can save lives. From mammograms to pap smears, annual examinations with your gynecologist can prevent any life-altering diseases. Today we’re going to list out a handful of the many reasons why it’s important to make an appointment with your gynecologist. If you live in the Hollywood, FL area, be sure to contact us today at Women to Women OB GYN Care if you have any questions or if you’re looking to schedule an appointment. Visiting the doctor annually is integral for maintaining an overall healthy lifestyle. When you visit your OB GYN, you’ll not only be checking in on the health of your lady bits, but you’ll be making sure that everything is running smoothly with your body. If breast cancer runs in your family, it is essential that you visit your OB GYN for mammograms. It is recommended that women over the age of 40 get breast examinations, but it’s not a bad idea to get one if you are younger, especially if your family has a history of breast cancer. An annual examination acts as breast cancer detection, and could be a lifesaver. Another preventative examination is a Pap smear. This detects signs of cervical cancer by testing for any precancerous or cancerous cells on the cervix. Women ages 21 and up are encouraged to begin regular Pap smears, as some women are more at risk for cervical cancer. Getting Pap smears every few years is a smart idea, but definitely consult with your doctor about how often you should schedule one. That being said, there are certain scenarios in which more frequent Pap smears are necessary. If you are HIV-positive, you should schedule a Pap smear more often. Talk with your doctor about what is best. Whether you’re pregnant or are planning on it, visiting your OB GYN will provide you with valuable medical information as you move forward in the pregnancy. 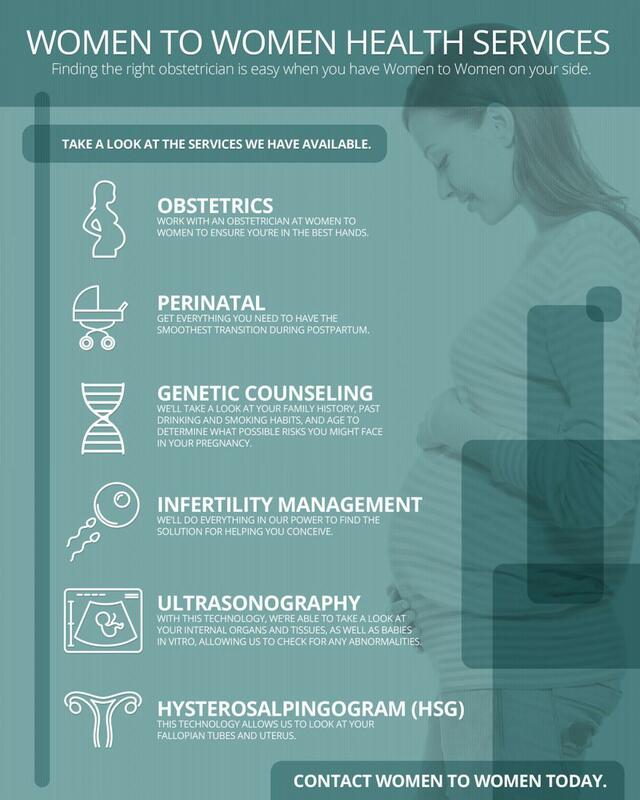 Our doctors here at Women To Women can assess your need for perinatal and genetic counseling, and can help you consider any risk factors that could affect your pregnancy. The reasons to visit the gynecologists are vast. Even though you may feel intimidated or worried, you should never brush off making an appointment. Here at Women to Women OB GYN Care, we understand how unnerving it can be to visit a gynecologist. That’s why we make it a priority to make each and every one of our patients feel comfortable. We pride ourselves in our state of the art women’s health center, which is an inviting and relaxing atmosphere for all of our patients. Our office is designed and utilized with privacy, discretion, and comfortability, first and foremost. Patients can even pick up their lab results on site, rather than having to drive to a different location. We hope this alleviates any of the worry and stress that can come with doctor’s visits. We hope that your experience at our facility provides you with comfort and peace of mind. If you’re needing to schedule a visit with a women’s health doctor, contact us today to book an appointment.